When I was but a wee lad working my first real job at the Docktor Pet Store in Crabtree Valley Mall, the next store over was a Chick-fil-A. I would regularly spend more at the restaurant in a 30 minute lunch break than I made in an hour hawking puppies and gerbils. But that was at a time when my metabolism could handle a fried sandwich every day without unwanted side effects. As I grew older and wider, I managed to avoid the Chick-fil-A menace by avoiding malls. This was not difficult because (1) I'm not all that into shopping among crowds of mallrats and (2) I am no longer a teenager and therefore do not see a mall as a legitimate weekend destination. And then the extra-mall Chick-fil-As began to show up and becon with their promise of greasy, secret-spicy goodness. And they built a store next to my place of employ. And my waist began to suffer again. Armed with fierce determination, I eventually weaned myself off of the fried and onto the grilled, and eventually away from the Chick-fil-A menace altogether. Then they started putting in playgrounds and so enlisted my offspring in the assault. Today, I may have to concede defeat. The Chick-fil-A menace has now added ... milkshakes. Very creamy milkshakes. Cookies and cream milkshakes. 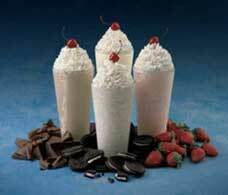 Nigh unto irresistable milkshakes. Ahhhhh .... milkshakes. I will be traveling to Japan next week in a vain attempt to avoid the horror and regain control of my waistline.